Manufactured Spend Canada: Using the Royal Canadian Mint! Manufactured Spend Canada and MS in the US have big differences. However, that’s not to say we haven’t gotten our opportunities. The Royal Canadian Mint is a great method to generate spend on credit cards. This is especially important for minimum spend requirements which have increased. We now see that the most lucrative cards such as the American Express Business Platinum with 75,000 Points requires $5,000 of spend to unlock the bonus. As well, this is a valuable day-to-day method to generating points for minimal cost. In ideal circumstances, it holds its own with prepaid cards and other opportunities. What is the (Canadian) Mint? The Mint is a Crown Corporation. In addition to producing our circulation coins for use everyday, they also sell precious metal coins on mint.ca. A small fraction of these are sold at face value, and can be found these under the dropdown of categories when you’re shopping. For example, this Superman coin is “worth” $20, and sells for $20. The basic idea of utilizing the mint for Manufactured Spend in Canada is buying these coins and cashing them out at a bank. This was the craze in the US with their mint a few years back. There are a few key differences, however. These coins are non-circulating legal tender. This mean they have the same value as banknotes, but given their irregular nature, are not used for everyday transactions. Therefore, you’re technically by Canadian law able to use and cash these out. In reality, the real issue is finding banks to accept them. Just like MS in the US, some people will have better luck than others, because the issue of cashing out coins is highly dependent on where you live, where you bank, and even the teller you’re interacting with. Disclaimer: I take no responsibility if you order these coins and are unable to cash these out. This is unlikely (and I’m happy to help as best as I can), but you have to know the risk and liability you’re getting involved in when purchasing these coins. THE MINT METHOD IS ONLY FOR ADVANCED MILES/POINTS USERS. For example, I know that people living in Ottawa will have a very easy time cashing these out, because everyone there knows about the mint. Where I live in Vancouver, nobody in the branch has any idea at all, so I’ve had to get corporate involved. If you run into problems, contacting customer service as high up as possible would probably get you a resolution. While the individual teller might not know what you’re talking about, someone at the bank will. In spite of all these warnings, overall, I would not worry about being able to cash these coins out. While it may be a hassle, it hasn’t taken me a phone call or a couple of emails to set everything right. I’ve outlined the process above – it’s fairly straightforward. As for specific strategies and tips on what to purchase, when/who/where to cash out, I’m not going to talk about that here. If I’ve chatted with you before, send me an email with specific questions and I’ll see what I can do. So why am I being so vague on the specifics? Let me give you an example. In the US, one of the easiest ways to manufacture spend is with prepaid debit cards and money orders. You buy these debit cards at stores where you get a credit card category bonus, and money order them out at a Walmart or grocery store. While everyone knows this, nobody’s going to post online which store to go to that’ll take credit cards, if you can stack any additional promotions, or how to trick the MO terminal to have it do what you want. That’s the same here. The process is straightforward and should be common knowledge – but the specifics allows the actual manufactured spend in Canada to happen. In a short answer yes – however, it really depends on your specific circumstances. The mint does ship to the United States free for orders above $100. 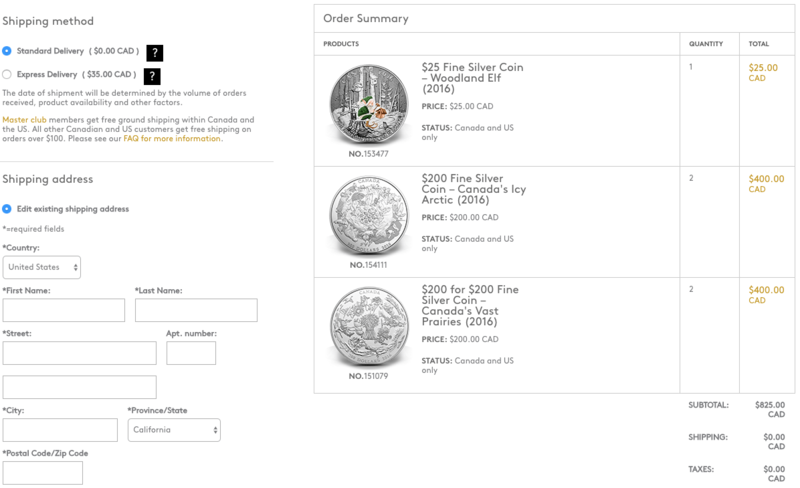 The Royal Canadian Mint must charge U.S. state sales tax for deliveries to the states in which the Royal Canadian Mint has registered to collect tax. If you can provide a valid tax exemption/resale certificate for the state of delivery then RCM does not have to charge the U.S. state sales tax. You need to have a Canadian Bank account, as banks will not give you Canadian cash on the spot. I don’t know how we treat FATCA, but I do know US citizens run into big issues trying to open bank accounts abroad, so that might be an issue. Here’s probably the biggest problem for Americans trying to do this. First, you end up with Canadian currency, which by itself isn’t a problem (at least we’re not the Egyptian Pound) but you have to pay your credit card bills in US dollars. Second, you have to be physically present at a bank branch in Canada to cash these out. You could always get a Canadian friend to do it, but that requires significant amounts of trust. I also have no knowledge on the customs process if you’re bringing significant amounts of coin from the US back into Canada, although I highly doubt it’d be an issue. If you need to meet minimum spend, purchasing coins on mint,ca is a good way. They accept Mastercard, Visa, and American Express, so all your bases are covered. Purchase your coins at the Canadian Mint here. thanks for the post – I am in toronto and bank with TD – do you know of anyone trying this in toronto with any of the banks? I am interested in doing this because I spend in CAD and earn USD from the states… so the rate after credit card bonuses is way better than the rates a bank will give me. Would you be willing to share which banks in Vancouver can deposit these? not all of us could have made it to points U. please share those oppurtunities here. I am interested in MS method. I live in U.S. and start getting into MS process. Hopefully you will share your expertise knowledge on MS. Please do not share my email address. Thank you. Have you noticed that the Mint no longer offers the $20 for $20 (and so on)? I noticed the Royal Mint website changed. I can no longer see the “$20 for $20” etc sections… How do I find these coins? Unfortuantely, they’ve removed those face value coins with the mint. Thanks for the reply. Any tips for now?